Passionfruit vines are very productive for the first few years of their life. My daughter recently harvested several large bagsfull from a rampant young vine that had grown to totally engulf her side fence after just 18 months in the garden. I stashed several ice cubes trays filled with pulp in the freezer and made a batch of curd but that hardly put a dent in the passionfruit horde. Some alternate method of preservation was needed to extend the life of the delicious passionfruits before they shrivelled up in the fruit bowl. Cordial seemed like the next best option. I turned to Donna Hay for guidance. I strained the passionfruit juice but then decided to return a couple of spoonfuls of seeds to the syrup so it looked unmistakedly like passionfruit. It was a silly decision, the seeds formed a plug in the neck of the bottle so after I’d taken my photos I strained out the seeds. It was much better. 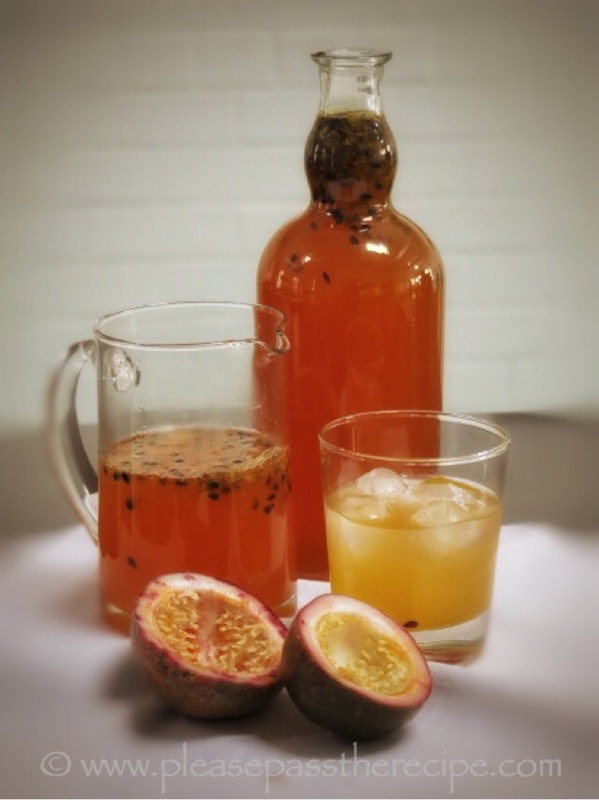 Mixed with icy cold soda water, passionfruit cordial makes a sweet, refreshing drink. The young kids love it! Mix together the water and sugar in a large saucepan. Stir the syrup over a medium heat until the sugar has dissolved. Stir in th passionfruit juice and citric acid. Decant into the sterilized bottles, seal, then store in the fridge. Makes 1.25 litres of cordial concentrate. *Soak off the old labels. Wash the bottles and lids in warm soapy water, rinse the insides thouroughly. Put the jars only on a tray in a preheated 120C oven for 30 minutes. Because of the plastic inner coatings on the metal lids, boil them in small saucepan of water for 5 minutes before sealing the bottles. Thanks Moya. It seems passionfruit are on the expensive list everywhere, lucky us. Fabulous! And can I say that I just love seeing your smiling face with your red specs in your little photo. I’m so glad you came around. It always gives me a smile. I should repost that post I did on people being a little more forthcoming and their gender, where they live, and so forth. I really like knowing, and there are still bloggers who I don’t know if they’re boy or girl! You alone are responsible for the world seeing my face, but I really appreciated the nudge you gave me. You should re publish Mimi. Hi Beck, i hope you enjoy consulting with your Mum as you blog as much as Leah and I did. We still talk food frequently although we now maintain separate websites. Creating a book of recipes from 3 generations of our family was quite gratifying. We had some hilarious moments making stuff from the 60s and then updating the ingredients so they fitted into our healthy additive free diet. We included both versions in the book! I adore passionfruit, but find them so expensive to buy here in Canberra, that I rarely get to eat them. Can imagine how delicious this cordial would be! Passionfruits do quite well in Melbourne as a summer/autumn crop, but they fruit in winter up north, probably why they’ve been quite cheap here recently, 10 for $5. I’m surprised that Canberra has missed out! Looks like something right up my alley! Wishing I had passion fruit right now. You’ve been posting delicious drinks too! Lovely to have a surplus of such passionate fruit. The seeds look great but can see they would be a pain. Plant a passionfruit Cheery, it will put a big smile on your face! Hasn’t winter been a shocker!! Excellent cordial. I wonder if fresh lemon juice could be substituted for the citric acid… Hope to plant a passion fruit vine and good to know they produce prolifically on young plants. Have you tried passionfruit sorbet? This entry was posted on July 30, 2015 by ladyredspecs in FODMAP diet, Food, Fruit Juice Cordial, Gluten Free, Preserves, Snacks, Syrup and tagged cordial, drinks, passionfruit.